Robson Ranch vs. Sun City Texas: Which Texas 55+ Community Is for You? If you're looking for a large 55+ community in Texas, Robson Ranch and Sun City Texas are great options. 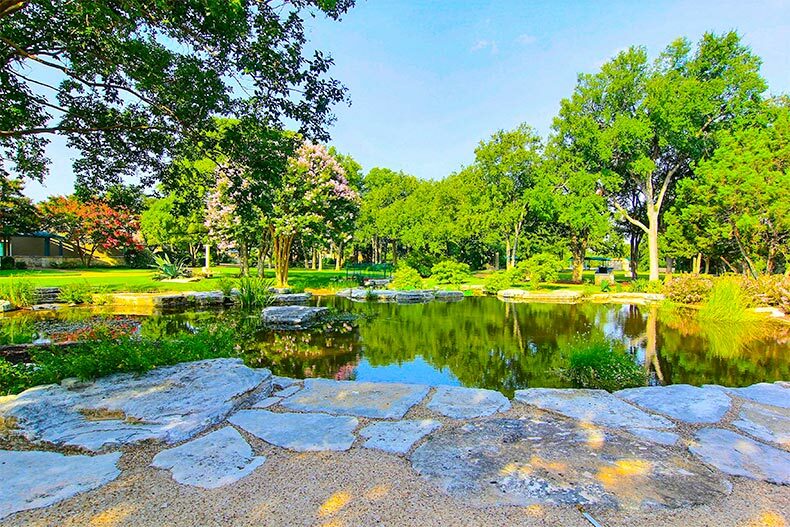 Active adults seeking a vibrant 55+ community in Texas have an abundance of options. The state contains dozens of age-restricted communities in different regions and at different price points, allowing active adult homebuyers to find the perfect retirement destination. Retirees who want to live in an action-packed and amenity-filled community often are torn between two of Texas’ biggest communities: Robson Ranch Texas in Denton and Sun City Texas in Georgetown. Here’s a side-by-side look at each community so active adults can take a closer look and decide which is best for them. Upon completion, Robson Ranch Texas will be one of the largest active adult communities in the state, containing a projected 7,200 homes. Situated in Denton, just north of the bustling Dallas-Fort Worth Metroplex, active adults can live life to the fullest right in their community or in a nearby city. The 17,500-square-foot Robson Ranch Clubhouse serves as the neighborhood’s central hub where neighbors gather for a variety of social activities and events. Active adults can pursue their favorite activities or learn new skills at the Robson Ranch Creative Arts and Technology Center. Active adult homebuyers can select from an appealing variety of single-family and attached homes designed with open living concepts, energy-efficient appliances, and inviting outdoor spaces. With 25 different floor plans available, including new constructions and resale homes, options abound. Homes range from 1,404 to nearly 4,000 square feet, giving active adults the right amount of space for their lifestyles and budgets. With a vast lineup of impressive homes and equally impressive amenities, it’s no wonder that active adults continue to be drawn to Robson Ranch. Active adults who long to live near the energy and excitement of Texas’ capital city will relish life in Sun City Texas, which is just 35 miles north of Austin in the beautiful city of Georgetown. This Del Webb community is the largest in Texas with more than 9,900 homes. The age-restricted community offers residents a rich variety of amenities, activities, and clubs, making it easy for active adults to dive into new endeavors, enjoy healthy pursuits, and make friends along the way. Altogether, Sun City Texas boasts more than 86,000 square feet of indoor amenities. A 20,000-square-foot fitness center contains all the latest cardiovascular and weight-training equipment while aerobics and dance studios offer fitness classes, Pilates, and yoga. There’s also a 4,000-square-foot woodshop and three 18-hole championship golf courses. Active adult homebuyers can choose from a variety of new and resale homes, including single-family and duplex homes that range from a cozy 940 to a spacious 3,000 square feet and up. Del Webb began the community in 1995 and currently continues construction, offering several dozen floor plans. Many homes feature upgraded touches such as spa-like bathrooms, custom outdoor living spaces, and gourmet kitchens. Whether retirees want to relax in a luxury home with a golf course view or an affordable villa, they can find exactly what they’re looking for at Sun City Texas.